Our Goal at 42 Aspens Productions is to build something that has meaning. We spend most of your time working, it is better to be doing something you are passionate about. We are creating a Culture where everyone plays a part has an inherent passion for moving our company forward. Being part of the solution, conversation and shares in the reward and accomplishment of fulfilling a need. We are striving to create something that can help people, or helps us evolve as a society, adding value to ourselves, our Future, Our society. Cooperation and Fun to motivate Partners and Team Members. Creation of Core Group of people who complement and inspire. Create a Company that Cares. This is one of the keys and the hardest to accomplish and it must start when you hire your first employee or Partner and be in the culture for every new hire. A sense of wanting the company and employees to succeed. Everyone must feel they are integral to the future prosperity of the company and yet at the same time not be held hostage to having to be available 24 hours a day. Everyone wants the same thing to be able to have a good paying job doing something they like to make a comfortable living but also have a life outside your job. So it is a tightrope but as long as you go in with that motto or philosophy in mind you should be able to balance it out. Create a Education system, with continuing education and learning an integral part of the culture. Exploring new idea’s new ways of doing things keep things fresh. Spending a certain amount of time learning new idea’s or new systems will keep things fresh and your body and mind motivated. What is 42 Aspens Productions? 42 Aspens Productions is a Video Production and Event Production Services Company. Providing Video Production and Event Planning to Promote Companies, Idea’s, Products, Inspiration and Social Awareness Projects. 42 Aspens Productions has been developing Crushed Grape Chronicles and 4farm2mrkt along with Re-developing A Warm Wish. We create Video’s for YouTube Channel Content, Business Introduction, Training Video’s and Website Content for introducing your Business to the world. We will be developing Events to Promote Business Partnerships and to Help Promote your Ideas, Products and Business Solutions. We have been working a Wine related blog since 2010 which has gone from a couple of incarnations from Rootstock, blog to a short stint as Wine tourista, to our now Crushed Grape Chronicles. 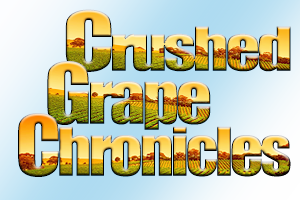 Crushed Grape Chronicles has been working on telling the Stories behind the Wine. Educating others and hopefully us along the way. As we continue we plan to start holding Events and Education seminars, tastings helping to educate a new wine audience along with an established Audience. Our Original Company is in development. We are planning and organizing for some future open date.